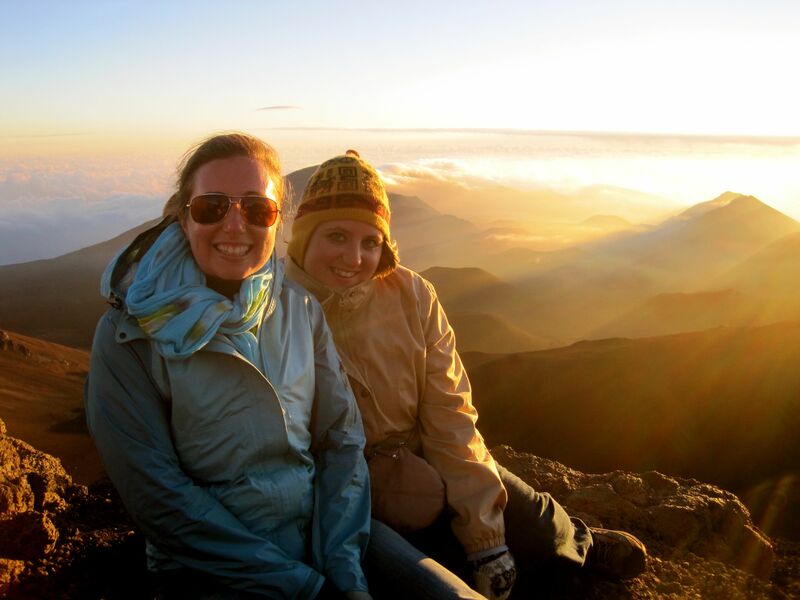 Among Maui’s best offerings (of which, I know, there are dozens – including this) is a trip to the top of the volcano Haleakalā at sunrise. 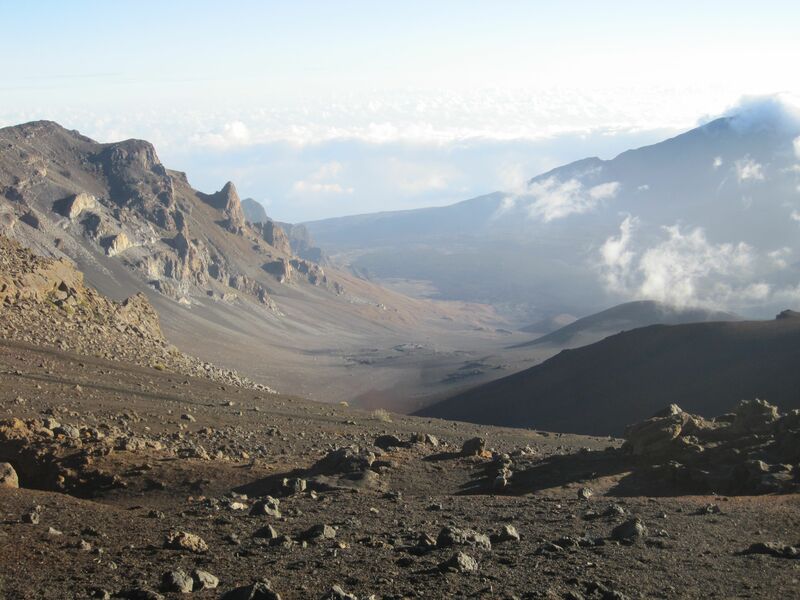 The legend of Hawaiian mythology says that the demigod Maui (after first creating the Hawaiian islands through a small act of trickery) climbed up the House of Sun (Haleakalā herself) to lasso the sun, slowing its journey across the sky and thus elongating the day. Now, I don’t know what would be more difficult: trying to describe what a sunrise at Haleakalā is, or to stop taking photos of it when you’re up there and actually experience it. Having only semi-sort-of achieved that latter goal, I will attempt the former. 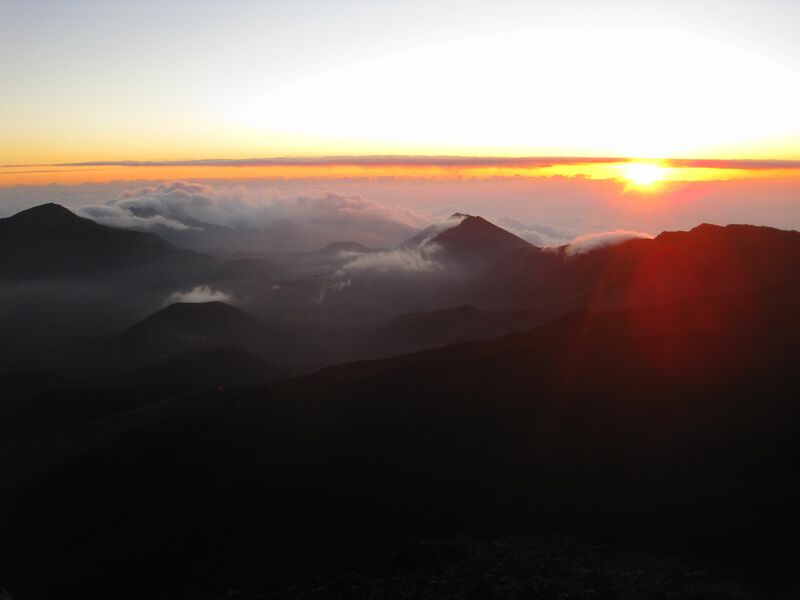 Being up at Haleakalā for a sunrise is to watch the heavens paint the earth. It’s only fitting, then, that a post-sunrise hike down the summit-area trails will likely be the most extraterrestrial journey of your hiking life. 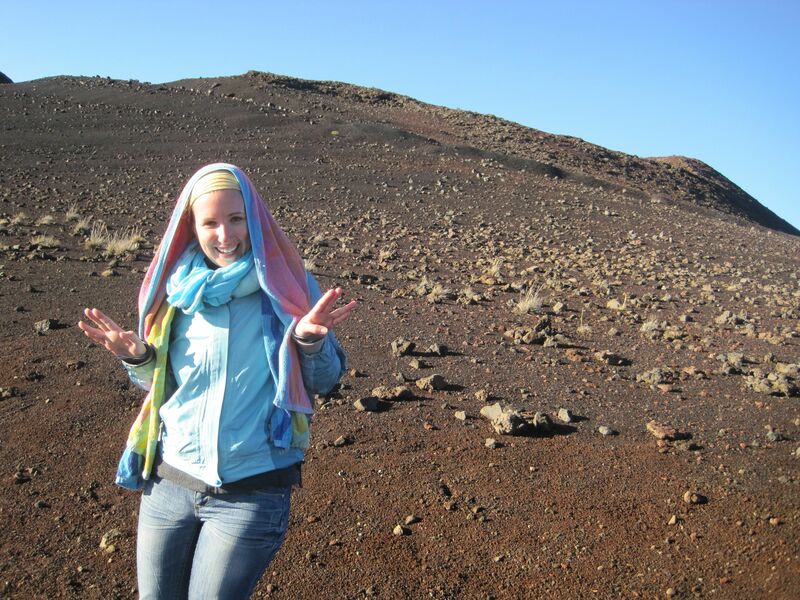 Hiking down feels like you’re on another planet, albeit one with gravity. Monochromatic, dusty, quiet, and craterous, this trail will test your stamina and stimulate your imagination. 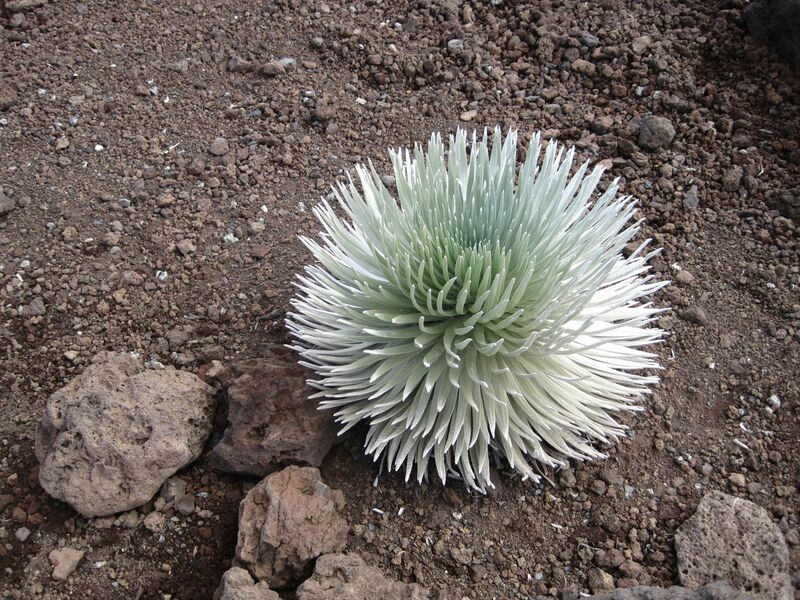 Dotting the path are dozens of these endangered plants – the silverswords, alien to all places but Haleakalā. Resembling more underwater creatures than volcanic dust dwellings, these curious plants shine much like the moon in a dark sky. 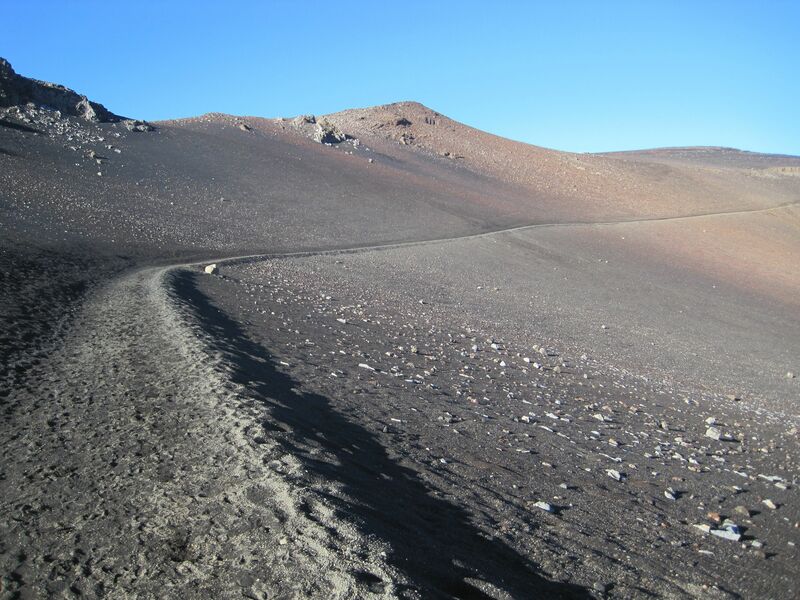 Hiking down the volcano is no easy feat. Parts of it are sandy, ashen. Such spectacular views may deceive you; the craters at the bottom look close enough to touch, but take a few hours to reach. In the meantime, you cross through an unforgiving environment in a high altitude; your lungs may gasp for oxygen. It is quite the early morning experience to be had. And, later, when you’re relaxing on one of Maui’s postcard beaches you can think, hey, for a few brief hours today I left the earth and came back to paradise. Planning a trip to Haleakalā (Hal. EE. ah. kah. la.) ? Get to the summit early, bird. Seriously. It takes a good half hour to drive up to the summit visitor center. You will be dizzy. This road is windy. The thing about Hawaii is, there are lots of other tourists. And the parking lots are pretty small. We left for the summit at 4am, and got one of the last parking spots. The visitor center is open 24 hours. It will be hard to wake up so early, but there is a splendor of stars waiting for you at the top, unlike anything you’ve ever seen. Unless, I suppose, if you live in a desert 10,000 miles away from anything. Then, I guess, enjoy your extra half hour of sleep. Dress in layers. The top is so so cold. So cold. So so so so cold. The hike is so warm. So so so warm. Bring a backpack. Bring a water bottle so you don’t dehydrate. Bring some snacks too just in case and/or to prevent you from becoming the subject of a movie in which James Franco will star as you. It’s pretty isolated out there, and not as many people do the hike as watch the sunrise. Keep track of time and ration your water/snacks. At the risk of sounding too “duh,” going down is easier than coming up. The return trek will easily take double the amount of time and effort it took getting down. If you’re going down and pass some weary souls walking back up, some kind words of encouragement will surely be appreciated. Don’t take pictures (sunrise only). Ahhh, I wish I could follow my own advice. This place, if you let it, will change you. It’s spiritual. Truly beautiful. The photos don’t even look like the real thing, anyway. Happy hiking, you beautiful little aliens! I always knew there was something strange about my best friend Kelly.